Chinese smartphone hopeful Meizu has hit a double headline whammy today by having what's supposed to be two unannounced devices, the Pro 6 and the M3 Note, leak on the internet, along with its April Fools joke, which is about a smart bra. While we can't confirm the photograph's authenticity, it does seem legitimate with the stickers on the back panel showing some certifications and fine print that the camera wasn't able to catch. The alleged Pro 6 is pictured in black and certainly looks the part of being a Pro-series handset. It has the downward-curved antenna bands up and down, which we've seen in previous leaks, and has the shine of a metal finish. 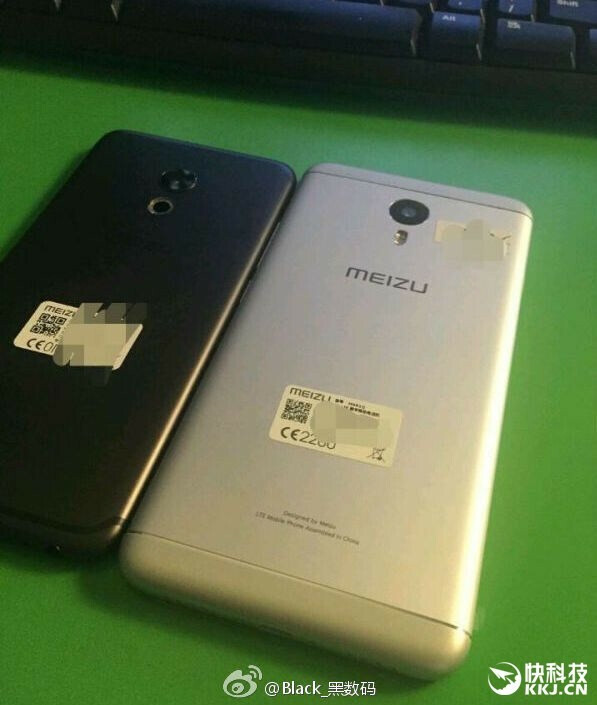 It appears that Meizu decided to place the finger scanner below the rear camera, rather than integrating it inside the Home button like on the Pro 5. However, this could also be a new LED flash assembly, so take our assumptions with a pinch of salt. Also, the handset appears smaller than what we'd expect of a 5.5-inch or 5.7-inch device, which means this could actually be the alleged 4.7-inch Meizu Pro 6 Mini. There's nothing else to make of the Pro 6 out of this photo, so let's move onto the alleged M3 Note. The phone appears to be made of metal rather than plastic this time around, although it could be just Meizu giving the plastic a faux-metal look, something the company is quite adept at. The handset also features a large camera lens, a dual-tone LED flash, and an up-to-date Meizu logo. In fact, the back panel looks remarkably like the one on the Meizu Pro 5, complete with the cleverly disguised plastic top and bottom, which are painted to blend with the metal finish, but allow for reliable signal reception. However, the Pro 5 has a single LED flash joined by a laser auto-focus module, so the photo clearly shows a different phone. Some argued this might be the Meizu M1 Metal, which was released late last year, but the M1 Metal doesn't have the antenna cuts etched into its top and bottom parts, so we're ruling out this possibility. It may be a slow news day, but at least it's April 1st, so everyone's in for a bit of laugh! This time, it's Meizu bringing the good vibes and questionable taste with the introduction of the Meizu Smart Bra. Available to everyone interested for $108 (699 Yuan), the wearable has allegedly been developed with the help of "Japanese massage experts" and delivers as many as 38 pieces of biometric data to the synchronized app in addition to fulfilling its main purpose of... well, we assume you know what bras are there for! While some may argue that bra jokes have become a sensitive topic or have simply ran out of fashion, smart bras do exist, and while there's certainly a bit of humor to such an invention, we won't be ones to deny its relevance. San Francisco company OMsignal is supposed to have the OMBbra up for sale soon. The $150 sports bra adapts to the female body and comes equipped with flexible sensors that track its activity, such as heart rate and breathing rhythm at the core of the body, measuring and recording the information in real time. The data is streamed to the paired iOS device via the OM smart box app. So Meizu could consider turning its joke into an actual product down the road. Mar 23, 2016, 7:00 AM, by Victor H.
Mar 21, 2016, 3:50 PM, by Alan F.
Looks like a great smartphone. Meizu should never got rid of that round led button on the front. That was a patent infringement on ZTE's Nubia line. Note 4 was the best Note.. Note 5 was a disappointment. I just bought the Note 3 and jumped to 5, very satisfied. My brother has the Note 3, 4 and 5 as well as the S6 and S7.. out of all of them the S7 has the worst camera out of all of them and the Note 4 just demolish everyone. Its confusing when we play around with these phones why people are reporting the S7 has the better camera when it clearly does not.